This coming December 16, 2011 in preview runs in IMAX theatres (general release on Dec 21), we will all be privy to Mission Impossible IV, now known under the title Ghost Protocol. According to IMDb, the writing credits go to Josh Applebaum and André Nemec. If you've seen the trailer, you already known the premise of the story: terrorist bombing at the Kremlin, IMF gets blamed, the team has to go undercover with no official support in order to find out who the real perpetrator is; all in a day's work. MovienewZ writes: This is not just another mission. The IMF is shut down when it’s implicated in a global terrorist bombing plot. Ghost Protocol is initiated and Ethan Hunt and his rogue new team must go undercover to clear their organization’s name. No help, no contact, off the grid. You have never seen a mission grittier and more intense than this. All three of the films that Brad Bird has directed and written – The Iron Giant, The Incredibles and Ratatouille – have been released to rave reviews. According to review aggregation website Metacritic, all three have received a rare universal acclaim rating, tallying together to give Brad Bird an average score of 90 out of 100 per film, making him one of the most acclaimed living filmmakers, animated or otherwise. Filming has supposedly taken place in Dubai, Prague, Moscow, Mumbai, and Vancouver. The trailer shows Cruise scaling the Burj Khalifa in Dubai, the world's tallest structure at 828 m (2,717 ft). It's interesting to note the jump in the film's rating on Rotten Tomatoes for number three in the franchise. Was the addition of Philip Seymour Hoffman as the bad guy that much of a plus to change the quality of the entire film in the eyes of the critics? I also note that J. J. Abrams was involved in the creation of the story for number three and directed the movie, his first involvement in the series. I'm looking forward to the thrill rush being as much of an adrenaline junkie as the next guy... or gal. I do, however, have to chuckle about the hype surrounding Tom doing his own stunts at the top of the tower, the Burj Khalifa, in Dubai. I trust everybody realizes that there is no way the film company would let him go out there if it wasn't safe. Yes, let's kill off our star in the middle of production. I'm mentioning this because I did a tandem parachute jump a while back (Parachuting: If God had meant me to...) and while anybody might say, "Oooo" at what appears to be dangerous, I was amused to discover in writing about my experience that statistically, I was safer parachuting than driving my car. Yep, I stand a better chance of getting creamed in a car then going splat jumping out of a plane. As such, I'm sure that what Tom was doing was more than just safe. After all, now the CN Tower in Toronto, Canada is offering something called EdgeWalk. It is the world's highest full-circle, hands-free walk at a height of 346 metres or 1,135 ft. Visitors are tethered to an overhead rail system and walk around the edge of the CN Tower's main pod above the 360 Restaurant on a 1.8-metre (5.9 ft) metal floor. So, thrilled by Tom climbing around Burj Khalifa? Come to Toronto and you can do sort of the same thing. 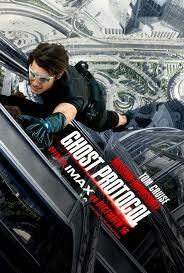 Yes, you too can not only see Ghost Protocol, you can do part of it. Mission: Impossible – Ghost Protocol is an upcoming 2011 spy film, and the fourth installment in the Mission: Impossible series. It stars Tom Cruise, who reprises his role of IMF Agent Ethan Hunt, and is director Brad Bird's first live-action film. Ghost Protocol was written by André Nemec and Josh Appelbaum, and produced by Cruise, J. J. Abrams (director of the third film) and Bryan Burk. Following the world premiere in Dubai on December 7, the film will have preview runs in IMAX theaters in the United States from December 16, 2011, with general release on December 21, 2011. It is the first Mission: Impossible film not produced by Paula Wagner, and the first to be partially filmed using IMAX cameras. The Mission: Impossible films are a series of action films based on the television series of the same name. The films feature Tom Cruise as Ethan Hunt, an I.M.F agent. Mission: Impossible is a 1996 action thriller directed by Brian De Palma and starring Tom Cruise. Following on from the television series of the same name, the plot follows a new agent, Ethan Hunt and his mission to uncover the mole within the CIA who has framed him for the murders of his entire IMF team. Mission: Impossible II (also known as M:i-2) is a 2000 action film directed by John Woo, and starring Tom Cruise, who also served as the film's producer. Mission: Impossible III (also known as M:i:III) is a 2006 action film. Burj Khalifa ("Khalifa Tower"), known as Burj Dubai prior to its inauguration, is a skyscraper in Dubai, United Arab Emirates, and is currently the tallest structure ever built, at 828 m (2,717 ft). Jeffrey Jacob "J.J." Abrams (born June 27, 1966), is an American film and television producer, screenwriter, director, actor, and composer. He wrote and produced feature films before co-creating the television series Felicity (1998–2002). He also created Alias (2001–2006) and co-created Lost (2004–2010), Fringe (2008–present), and Undercovers (2010). Abrams directed the films Mission: Impossible III (2006), Star Trek (2009), and Super 8 (2011) and produced the films Cloverfield (2008) and Morning Glory (2010). Thomas Cruise Mapother IV (born July 3, 1962), better known as Tom Cruise, is an American film actor and producer. He has been nominated for three Academy Awards and he has won three Golden Globe Awards.